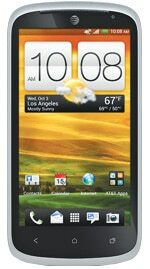 The HTC One VX is a mid-range Android 4.0 smartphone exclusive to AT&T in the US. It features a 4.5-inch 540 by 960 qHD display, a dual-core 1.2GHz processor and a 5MP camera, as well as NFC. Read Engadget’s review of the One VX here.